A traditional symbolic representation of the idea of ‘object’ (a chair) was offered up to an instrument of musical measure (a musical keyboard) in order to produce metric readings, which were then organised/interpreted so as to provide material for a musical realisation of the object. Thus a musical instrument (the keyboard) is used as a measuring instrument and, by process of inversion, the physical subject/object (the chair) becomes a representation of musical measures. 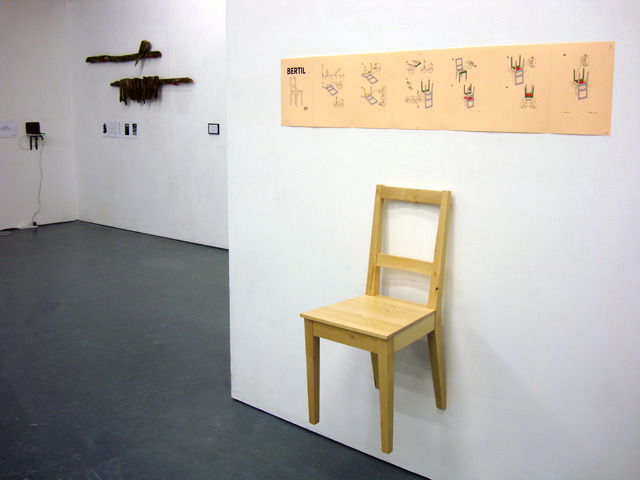 An archetypal chair was chosen from the Ikea catalogue, and the accompanying instructions for its assembly used as a way of deciding upon a measuring procedure and sequence. In this way the instructions also function as a graphic score for the piece. There are five main structural components in a BERTIL chair. These were colour-coded in the score and then ‘played’ in sequence by pressing them into the keyboard, with the direction of motion required in order to achieve an adequate measure of their dimensions suggested by the score. It was decided that only the white notes (which permitted a more consistent and continuous form of contact) would be used. This harmonic restriction not only provides a pleasant tonal centre for the piece (C major/A minor), but middle C also acts as the literal tonal centre for the measurement procedure, with each component offered up to the keyboard symmetrically in relation to that central point. Pitch values are thus dependent upon how the components are constructed (e.g. the width of a chair leg was found to depress two adjoining keys), as well as how they are shown in relation to each other within the assembly instructions. This practical procedural decision exerts a basic contrapuntal compositional device (a sort of ‘contrary motion’) which in turn produces balanced motival form. A moderate tempo of 60 bpm was used so as to provide a suitable rate of movement for accurate readings. This tempo/rate was also chosen in order to provide a comfortable pace in which to ply the components into the keyboard (60bpm@64mm per second), whilst also allowing the components’ physical dimensions to be directly mirrored in standard rhythmic divisions, i.e./e.g. at 60 bpm, a beat (a crotchet) lasts one second = 64mm. A sixteenth note (a semiquaver) thus lasts ¼ of a second = 16mm. A whole note (a semi-breve/4 crotchet beats) last 4 seconds = 256mm, while at the other extreme of our conversion table a 256th note lasts 1/64th of a second = 1mm. The ‘readings’ (pitch values and durations) were then entered into a MIDI (musical instrument digital interface) sequencing computer programme, where a separate musical part was created for each component part, with each assigned a different keyboard sound in order to facilitate identification, clarity and timbral variety. The more drawn out drones tend to be the chair’s legs or the side braces. The larger clusters, relatively short in duration, are when lateral pieces such as back braces depress an extended bank of keys (the seat produces a somewhat longer cluster about three quarters in). The sequence of four short stabs, which reappear at regular intervals, are produced by/representational of the tips of the four upturned chair legs. The piece lasts 2’ 25”. Exhibitors: Julia Dwyer / Sue Ridge, Takako Hasegawa, Emma Hunter, Kristina Kotov, Robin Jenkins, Aaron McPeake Pete Maloney/Michael Roberts, Martin Newth, Colin Priest, Peter Stickland, Ken Wilder. a gap, and the artwork itself; they also measure a piece of music or performance art, our inability to judge measurements, and the cervical dilations leading to childbirth. The exhibition comprises sculptural objects, books, postcards and films and slide projections.